Music fills the park and his life. WASHINGTON — The fingernails picking at the strings of the guitar are lined with black dirt. The arms are tattooed. Hard, calloused fingers move up and down the neck, connecting chords and filling the park with music. Pete Andersen (“That’s Andersen with an ‘e,’” he’s quick to point out) sits on a curved piece of concrete in this shady pocket of Washington. 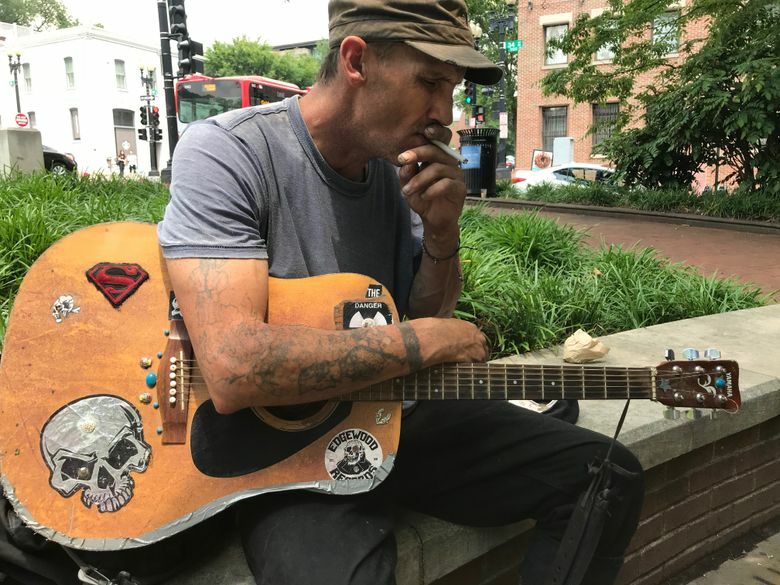 He’s got some weed that he’d like to smoke, but at the moment there is a more pressing issue — earning enough money to buy some new guitar strings, a burner phone and a bus ticket to New York City. “I need a band,” he says. Andersen puts his head down and begins to strum. It’s an Alice in Chains riff. He’s also able to do some Nirvana. A teenager back in the 1990s, he digs them all. Pearl Jam. Soundgarden. Cue “Soul to Squeeze” by the Red Hot Chili Peppers. A jet flies overhead on its approach to Reagan airport. Honking cars are to his back as they angrily merge off the Francis Scott Key Bridge and into Georgetown. It doesn’t interrupt his flow. The park, he says, has been a good place to spend his days. He said it’s not heavily trafficked by police, and smoking marijuana there isn’t a problem. There’s lots of shade and summer is creeping in already. On this June morning, the humidity is flexing its muscles — giving locals a taste of what’s to come in July and August. “Jimi Hendrix did the best one,” Andersen says. Andersen is aware the country is in the midst of an argument over whether NFL players should be allowed to kneel during the playing of the national anthem before games. But on this day, in this park and in this life, Andersen doesn’t have much time to think about such matters. 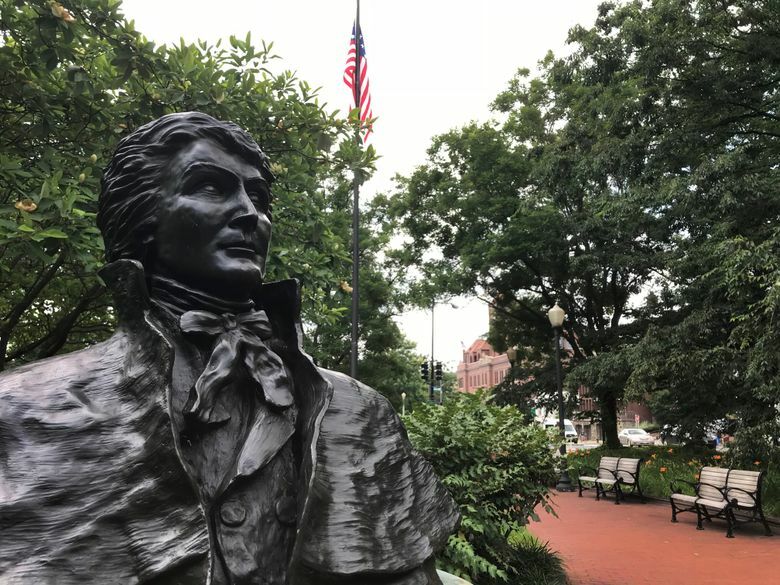 Francis Scott Key Memorial park was donated to the National Park Service in 1993 and was placed there because Key owned a house in the Georgetown area. Key wrote the words to “The Star-Spangled Banner” in 1814 and it became the country’s official national anthem in 1931. Andersen wasn’t born until 1972. He says he joined the U.S. Navy as a teenager and saw the world. He ticks off the destinations: Riyadh, Bahrain, Perth, Hawaii, Spain. He also admits he didn’t have much of a career in the Navy. He got busted for cocaine and marijuana. That was in 1991 in Southern California. It’s getting into early afternoon. In the course of a few hours fewer than a dozen people have stopped in the park. Most either jog their way through it down to the shoreline of the Potomac River — its brown water dotted with a few kayaks and people on stand-up paddleboards — or cut through the park on their way to Georgetown. His hat has some coins in it — and a few bills — but nobody has dropped anything in for a while. He has another hat that he’s been wearing and he takes off to wipe his brow. There is a path that leads down to the Potomac’s edge and there are homeless people there he says are worse off than him. He’s got a tent. Andersen says he would like to move up enough to afford a camper to live in. But first he’s got to get that band together. He’s written some songs. He plays one called “I Feel Like Riding,” a blues-infused tune that he won’t let be recorded. “I don’t want anyone to steal it,” he explains. Music is something he picked up about seven years ago, he says. It wasn’t long after, he said, that he stopped the hard drugs he decided were taking him nowhere. He says he’s been to 39 states and this stop in Washington, D.C., began early this year after walking from Richmond. He figures a bus ticket to New York is about $29. New strings are $5. A burner phone — maybe $20. The guitar is still in good shape — though its body looks like it’s seen a few rough days. Duct tape lines its outer edges. Andersen says he got it in November for less than $100 after the last one got busted up. He thinks. He’s vague about the circumstances. This one, though, he is taking care of and he’s decorated it on the front and back with stickers — including a skull, one that says “Radioactive” and his most recent one from a cannabis shop called Five Star Edibles. The crowds along M Street Northwest walk past the park, ducking into high-end furniture stores, boutiques and swanky bars that are a mix of bright colors and white clapboard sides. Some have glass windows and there is a New England vibe to it all. Andersen stands up and slips on his black backpack and picks up his guitar. It’s time to try and get something to eat, he decides. The music will begin again. Probably in the park. Maybe somewhere else. Hopefully, he says, in New York City. He merges onto the sidewalk and settles into the flow of people walking down the street — ultimately disappearing into the crowd. Nobody gives him a second glance. And the park is quiet again.